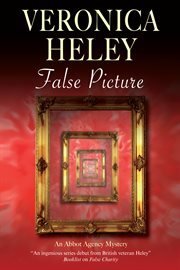 The item False picture, Veronica Heley represents a specific, individual, material embodiment of a distinct intellectual or artistic creation found in Evansville Vanderburgh Public Library. Velma is charm itself, especially when she's being inexact with the truth. Now she wants Bea, widowed owner of the Abbot Agency, to check up on her stepson Philip, as he's somehow acquired a valuable picture last seen in the flat of an elderly lady who's been murdered. However, a professional art thief is also after the picture. Can Bea locate Philip and the missing Millais without falling foul of someone who already has several murders to his credit?